For the umpteenth telling of the classic myth, we head to 2017’s King Arthur: Legend of the Sword. 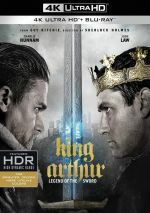 In the Dark Ages, Uther Pendragon (Eric Bana) rules the Britons until his brother Vortigern (Jude Law) stages a coup. Only one survivor escapes this violent act: Uther’s very young son Arthur. As the boy grows to a man (Charlie Hunnam), Arthur lives a difficult hand-to-mouth life. Trained as a fighter, he works his way back to prominence and eventually pursues his regal birthright. I believe we last saw a big-budget version of this story with 2004’s King Arthur. That one took a “realistic” approach to the subject – ie, one without overt magic/mysticism. From Minute One, Legend lets us know it’ll follow a much more fantasy-oriented take on the subject, and its opening shot feels like an outtake from Lord of the Rings. Frankly, this seems like the better way to go than the “realistic” 2004 film, as the Arthurian myth satisfies more when viewed through the lens of magic. For the movie’s first act or so, the choice pays off, as Legend brings a fairly exciting take on the legend. It promises good drama and excitement, with dynamic action scenes and a fresh view of the material. “Arthur as street thug” seems like a quirky attitude, but it works in its own kooky way. Once Arthur pulls sword from stone, however, Legend takes a serious downward turn, one from which it never recovers. The movie invests too much in its own self-satisfied sense of mythology, and the story piddles and plods. This means the characters develop in dull, predictable ways that fail to take flight. Arthur seems like a flat role without the necessary charisma, and the rest fail to become anything memorable as well. It doesn’t help that Legend “borrows” heavily from many other films. In addition to the Lord of the Rings influence, we can see clear signs of other efforts like Empire Strikes Back and The Ten Commandments. Toss in a lot of Robin Hood and these choices make the movie feel recycled and unoriginal. Legend still manages the occasional glimmer of excitement, but it becomes a case of diminishing returns as it goes. These factors turn it into a mostly unsatisfying exploration of the Arthur myth. 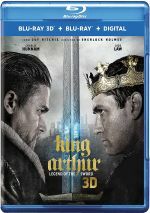 King Arthur: Legend of the Sword appears in an aspect ratio of approximately 2.40:1 on this Blu-ray Disc. This was a good representation of the source. Sharpness came across well. Little softness materialized, so the majority of the flick appeared nicely detailed and concise. I noticed no signs of jagged edges or shimmering, and edge haloes failed to occur. The movie lacked source defects. As expected, Legend went with a teal overtone as well as some orange. Within those constraints, the hues seemed well-rendered. Black levels seemed dense, and shadow detail was generally solid, though a few shots were somewhat thick. Some rather dark “day for night” shots looked the worst. Overall, this became a satisfying presentation. Even better, the Dolby Atmos soundtrack of Legend helped bring the material to life. Downconverted to Dolby TrueHD 7.1 on my system, the soundfield provided an engaging piece. Music consistently demonstrated smooth stereo imaging, while the effects also popped up in the appropriate places. Scenes with movement blended together well, and the movie offered a very good sense of ambience. It also featured some vibrant action scenes that created an involving setting. The battles and magical elements used all the channels in a dynamic manner and filled the room well. Audio quality always sounded solid. Speech appeared distinct and crisp, and I detected no issues with edginess or intelligibility. Music seemed bright and clear, as the score showed nice range and definition. Effects also fared well. They depicted the elements concisely and with fine dimensionality. Bass response seemed quite good, so low-end was consistently tight and firm. Ultimately, the audio of Legend served the movie. Eight featurettes appear here, and we open with Arthur With Swagger. It goes for nine minutes, 41 seconds and involves writer/director Guy Ritchie, writer Joby Harold, stunt coordinator Eunice Huthart, makeup and hair designer Christine Blundell, and actors Charlie Hunnam, Annabelle Wallis, Neil Maskell, Craig McGinlay, Georgina Campbell, and Kingsley Ben-Adir. “Swagger” mainly looksat Hunnam and his work on the film. This brings a few good notes but most of it concentrates on praise for the lead actor. During the 18-minute, 49-second Sword from the Stone, we hear from Ritchie, Maskell, Harold, Wallis, Ben-Adir, writer Lionel Wigram, costume designer Annnie Symons, supervising location manager Amanda Stevens, producer Steve Clark-Hall, and actors Jude Law, Djimon Hounsou, Freddie Fox, and Eric Bana. “Stone” looks at the film’s updating of the Arthurian legend. It becomes a fairly good overview. Next comes Parry and Bleed, a five-minute, 44-second reel with Hunnam, Bana, Fox, Ben-Adir, Hounsou, fight coordinator Mike Lambert, stunt performers Cali Nelle and Richard Wheeldon, and actor Aidan Gillen. As expected, “Parry” looks at the film’s stunts and fight scenes. Its comments feel somewhat fluffy but compensates with good footage from the shoot. With Building on the Past, we get a 14-minute program with notes from Ritchie, Maskell, Gillen, Wallis, Ben-Adir, Law, Wigram, Hunnam, Bana, production designer Gemma Jackson, art department assistant Danny Clark, set decorator Tina Jones, and carpenter Brian Latter. “Past” examines the film’s sets, locations and production design. It becomes an efficient examination of the subject matter. After this we locate Inside the Cut. It lasts six minutes, eight seconds and includes comments from Huthart, Fox, Lambert, Hunnam and Ritchie. “Cut” mainly discusses Huthart’s work on the shoot, and its focus on her manic personality makes it interesting. Camelot in 93 Days takes up 10 minutes, 23 seconds with details from Ritchie, Hunnam, Fox, Wigram, Maskell, Ben-Adir, Symons, Jackson, production sound mixer Simon Hayes, visual effects supervisor Nick Davis, and actors Poppy Delevingne, Katie McGrath and David Beckham. “Days” offers a general view of the shoot and ends up as a fairly superficial, perky affair. 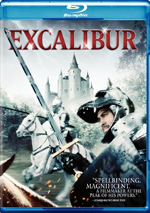 In the six-minute, five-second Legend of Excalibur, we hear from Harold, Hunnam, supervising armourer Tim Wildgoose and armoury trainee Allistair Halliday. “Legend” examines the design and creation of the film’s sword, and it does so in a productive manner. Finally, Scenic Scotland runs five minutes, 33 seconds and features Clark-Hall, Hunnam, and Ritchie. It throws out thoughts about location shooting and becomes a decent snapshot. The disc opens with an ad for Dunkirk. No trailer for Legend appears here. A second disc presents a DVD copy of Legend. It includes “Swagger” but lacks the other extras. 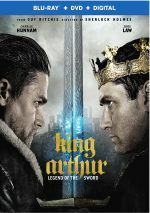 For a while, King Arthur: Legend of the Sword threatens to deliver a compelling reimagining of the source material. However, it loses steam as it goes and becomes too unoriginal to succeed. The Blu-ray offers very good picture and audio as well as a reasonable set of supplements. Legend isn’t the worst version of the Arthur story but it’s a mediocre film.